Aspalathus, the genus to which the rooibos tea plant belongs, is the largest member of the pea family endemic to South Africa. A genus the size of Aspalathus displays a large variety of morphological features separating the species from one another. However, it possesses features shared among all the species that make it a well-defined group of plants. Some of the main shared features are highlighted below. All species are perennial shrubs, very rarely small trees. Plants are prostrate, ascending or erect, often with thorny branches. Leaves are single or in threes and without a stalk or stipules. The leaves often appear as dense clusters. Leaflets varying from flat to rounded are often spine-tipped. Flowers are mainly yellow, but in a few species they are purple or white. They are borne in groups or are sometimes solitary on branch tips. 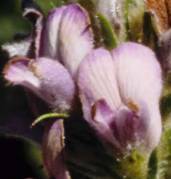 The typical pea flower consists of a standard, wings and a keel petal. Stamens unite basally for three quarters to form a split sheath. Of the 10 anthers, 5 are short and dorsifixed, 4 long and basifixed and one usually intermediate. The pistil consists of a unilocular ovary, an upcurved or straight style and a capitate stigma. The pod is usually compressed with one to several seeds. Habitat destruction due to housing development and farming activities have led to many species becoming threatened or endangered. Aspalathus variegata last collected in 1898 on the Cape Flats near Raapenburg is probably extinct. Another species, A. tylodes believed to be extinct on the Cape Flats, was re-collected by myself in Kraaifontein in 1998. At this locality, houses have now replaced the plants. The fate of a population of the endangered species, A. rycroftii at the Malmesbury showground was the same. Some species are only known from single collections from remote or inaccessible places and are is in this way protected from possible harmful anthropogenic activities. Aspalathus comprises 278 species, mainly concentrated in the Cape Floristic Region. Only six species extend into KwaZulu-Natal. A new species discovered and described by me will be published soon and will increase the number of species to 279. Most species grow in mountains and are restricted to certain soil types. The majority prefers Table Mountain Sandstone substrates, whereas others are confined to marine sand, to limestone outcrops or to clayey soils weathered from shale. The name aspalathus appears in the Bible, but it probably does not refer to Aspalathus in the present sense, but rather to a species of Convolvulus or Alhagi instead. Breyne published the first printed accounts of Aspalathus species as we currently know it, in 1678. Linnaeus used the name for the first time in 1740 in Systema naturae. Later in Species plantarum (1753) he described 12 species. Generally plants may live for 20 years or more and during the life span they usually flower regularly once a year. Flowering usually starts when plants are two to four years old. The flowering period is mainly from September to December, but in a few species it falls within January-February. Plants survive fire as reseeders or resprouters. In the case of Aspalathus linearis some populations are reseeders, whereas others are sprouters. Seeds resting in the ground remain viable for at least six years and germinate profusely after fire. Therefore, many species which are thought to be absent, may appear after a fire. Aspalathus linearis, commonly known as the rooibos tea plant, is the only species of economic value. 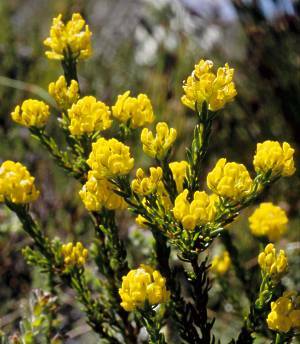 The indigenous people of the Cederberg area used it as a beverage long before the European settlers arrived. Rooibos is caffeine free, low in tannins and rich in anti-oxidants and is enjoyed not only as a herbal tea, but is also used as an ingredient in a wide range of cosmetic products. The cultivation and production of rooibos is now a multimillion rand industry. Species of Aspalathus have never been developed into garden plants, although many attractive species show great potential as garden plants. Possible reasons for this are the difficulty in propagation by seed or root cuttings and in providing the optimal growing conditions for the plants. A. callosa L. Erect or ascending shrublet, 0.15-0.4 m tall. Leaves trifoliolate, leaflets linear and flattened. Flowers arranged in terminal heads. Flowering time: September to January. This species grows in sand and sandstone gravel in the Cape Peninsula, Somerset West, Caledon and Bredasdorp. A. cephalotes Thunb. Erect or ascending shrub, 0.3-0.8 m tall. Leaves trifoliolate, leaflets linear, rounded or slightly flattened. The violet flowers are arranged in spikes or heads. Flowering time: July to November. This species is divided into three subspecies, A. cephalotes subsp. cephalotes, A. cephalotes subsp. violacea and A. cephalotes subsp. obscuriflora. Occurs on sandy and often somewhat clayey soil in the mountains of Stellenbosch, Franshoek, Somerset West, Caledon, Worcester, Piketberg and Tulbagh. A. cordata (L.) R.Dahlgren Erect or ascending shrub, 0.4-0.8 m tall, rigid and freely branched. Leaves simple, lanceolate to broadly ovate, margins prominent. Flowers terminal in groups of 4-8. Flowering time: August to December. Grows on sandy slopes and foothills. Cape Peninsula, Cape Hangklip, Bellville, Somerset West, Worcester, Malmesbury, Piketberg and Tulbagh. A. quinquefolia L. Erect or sometimes almost a prostrate shrub, 0.2-1.5 m tall. Leaves trifoliolate, leaflets distinctly flat, generally with dense grey hairs, Flowers terminal in sparse or dense groups. Flowering time: August to February. A. quinquefolia is divided into three subspecies, A. quinquefolia subsp. quinquefolia, A. quinquefolia subsp. compacta and A. quinquefolia subsp. virgata. This species grows on sandy lowlands throughout most of the Cape Floristic Region. A. spinescens Thunb. Erect, branched shrub, 0.6-2 m tall. Branches are rigid, straight and ending as strong thorns. Leaves trifoliolate, leaflets egg-shaped to linear and rounded. Flowers solitary in groups of 2 or 3, distributed in great numbers along the branches. Flowering time: August to December. A spinescens is separated into two subspecies: A spinescens subsp. spinescens which is restricted to sand flats in the Malmesbury and Hopefield Divisions and A. spinescens subsp. lepida which is common near Piketberg and in the Olifants River Valley. A. tridentata L. Erect or ascending shrub, generally 0.3-0.9 m tall, moderately branched. Leaves trifoliolate, leaflets distinctly flat, often hairy. Flowers terminal, in groups of 2-12 or more, all radiating from the same point. Flowering time: August to December. This species is divided into four subspecies occurring in a variety of habitats from the Cape Peninsula to Bredasdorp and Swellendam in the southeast to Vanrhynsdorp and Calvinia in the north. Dahlgren, R. 1988. Crotalarieae ( Aspalathus ). Flora of southern Africa 16,3: 1-423. Leistner, O.A.(ed.). 2000 Seed plants of southern Africa : families and genera. Strelitzia 10. National Botanical Institute. Pretoria.